In July’s All That Sparkles And Sews Collective market weekend, one of the guest sellers was Julie from Crafty Crofter and she featured her fudge gift boxes. Now, Me J and I are partial to a bit of fudge and have missed our yearly Newquay holiday indulgence so I decided to give a fellow small business a hand and ordered a box. 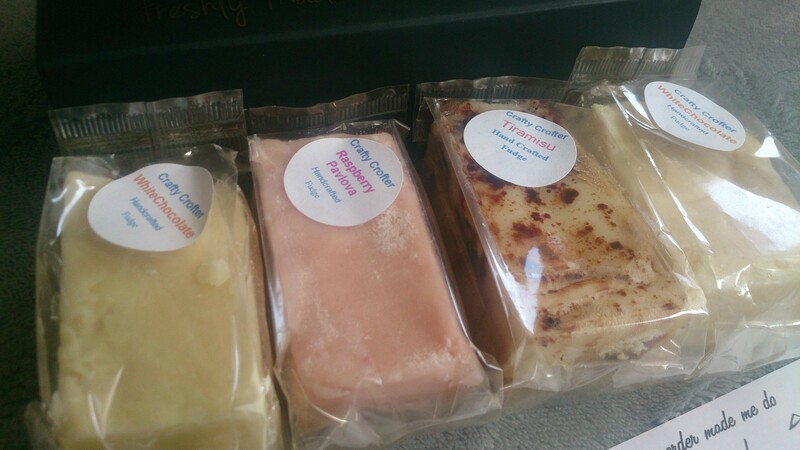 Julie had a large selection of flavours to choose from, which can be found HERE minus a few which haven’t been listed yet; Tropical Sunburst, Lime & Coconut, Chocolate Lime, Neapolitan, Tiramisu and Strawberry Pavlova. In these gift boxes, you can have a choice of 4 bars at a net weight of 98 grams each. They were on special offer at the time for the market at £8.50 plus postage, which I thought was a great price. I opted for 2 white chocolate as it’s Mr J’s favourite, a tiramisu for myself and a raspberry pavlova for Mr J and I to share (which Julie was amazed by I might add). Each bar of fudge was individually wrapped and labelled, while presented in a black gift box with Crafty Crofters business card and a thank you note from Julie. Just opening the box made my mouth water. The fudge looked delicious and both Mr J and I were eager to try it out. What I also liked was how homemade it actually looked. They were a little odd-shaped here and there which gave it more of a homemade feel than if the cuts were perfect. As I know they are his favourites, I passed Mr J one of the white chocolate bars which he opened and we shared. Just from the first bite I knew that this wouldn’t be my last order from Crafty Crofter. I definitely think I audibly Mmmmed when I chewed the first bite. The white chocolate fudge was sweet without being overly sweet and the flavouring was spot on. The texture was a perfect fudge texture too; it wasn’t hard but it wasn’t too soft either. The tiramisu fudge for me tasted fantastic. It was a perfect tiramisu flavour without being overwhelmed by coffee. It even had pieces of sponge fingers inside. I must admit that out of the 3 flavours I picked out, this has to be my favourite. It still had the same great texture as the white chocolate fudge had. The raspberry pavlova also has a lovely taste and the same gorgeous texture as the other two flavours. It wasn’t overly tart as you could probably imagine with it being raspberries. You also couldn’t go wrong with the small pieces of meringue throughout. 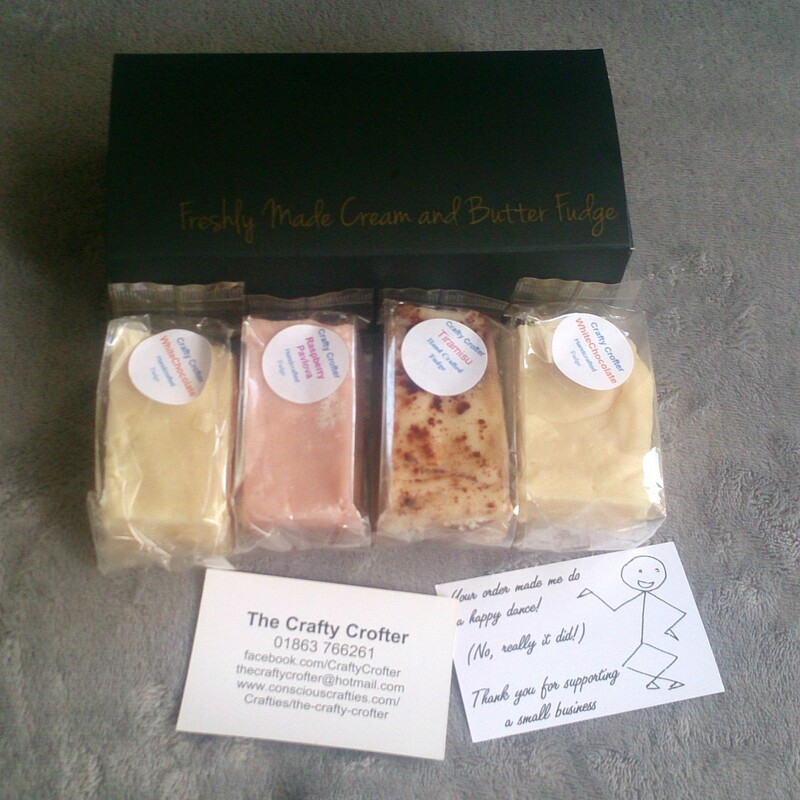 All in all, purchasing this fudge gift box from Crafty Crofter was not a waste by any means. This box was for us but it would have made a great gift and I can honestly say that it will not be my one and only purchase. Thank you Julie for this amazing fudge. Have you heard of Crafty Crofter? Which flavours would you pick if you made an order? I’d love to hear from you. Please leave any comments below. I love to read what you all have to say. Ooh yum. They look really nice. I’m craving some fudge now!